Is he worth it? 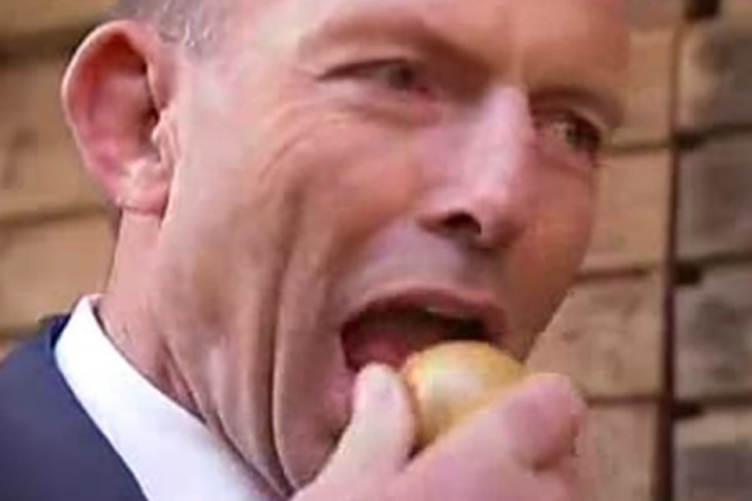 Is Tony Abbott’s Prime Ministerialship worth it since he’s done such irreparable damage to your brand? I have no doubt when Abbott won the election, you thought you’d done the right thing. After losing in 2007, I’m sure you were upset. But then losing again in 2010, after Abbott failed to negotiate to form a minority government, must have been torture. You must have been livid that Julia Gillard, a leader you despised, (a woman no less! ), was so proficient at getting things done, developing progressive policies and negotiating to make them happen. Policies that filled you with dread that Australians might actually care about each other. I understand you’re all very confused about whether you’re neoliberal ideologues or socially conservative, and sometimes it’s hard to know what you really are because all you truly care about is looking after your business mates at the expense of workers. It makes it hard for you to have a persuasive narrative. Because some of you only care about keeping Australia backward, focussing on destroying socially progressive policies such as marriage equality, while the rest are only interested in your special brand of small-government-neoliberalism which is defined by a quest to increase the profits of those people who finance your campaigns. But you understood Gillard and Rudd, and the Labor Party, were a threat to all of you one way or another and therefore must be destroyed if you were ever going to undo all the progress they made. So you built the Abbott wrecking ball with this mission in mind. With the help of Rupert Murdoch and his flying monkeys in the conservative press, you designed this wrecking ball, this no-machine, this village idiot who spouts three word slogans like an android, in order to scare the electorate into giving the Liberal Party what you feel is your entitlement; power. And it all seemed to be going so well! That is, until the first day in the job when you surely immediately realised you’d made a mistake. And that’s why I ask whether this mistake was worth it. Maybe you’ve been too scared to ask yourself this question, let alone answer it. But now you’re heading towards the next election, surely you have to face reality at some point? How about I try answering the question for you and you can decide if you agree with me? There are three reasons why Abbott was not worth it for the Liberal Party. He might have got you the term in government that you desperately wanted, but what has this term done to your future? The first reason Abbott was certainly not worth it is because he’s impotent. Politically, he has achieved very little and made a huge amount of mess in the process. Yes, he got rid of the mining tax and the Carbon Price. But this caused problems for you too since revenue disappeared along with these policies. Yes, you think Abbott’s done wonders in ‘stopping the boats’. But once this promise helped win the election, what good did it actually do for your political fortune? Other than costing a lot of money to keep people locked up in a hell-hole indefinitely, and causing you to have to keep secret anything to do with boats, which you’re no doubt not happy about because you love demonising refugees so you must be sorry you’ve painted yourself into a ‘we can’t tell you what’s going on because you’re not going to like it’ corner. And then there was the promise Abbott made, which you no doubt regret, to not make any cuts to education, health, the ABC and SBS. But what is the point of a Liberal government that doesn’t make cuts to education, health, the ABC and SBS? I do understand that you have to pretend you’re something you’re not in order to get elected. It must be very stressful having to keep up this façade when all you really want to do is bring back WorkChoices. Either way, Abbott’s promises were quickly broken, so even where he has managed to make spending cuts, they’ve not been celebrated as you might have hoped, but rather accurately painted as lies and more fodder for the independents to block much of the ‘reform’ you would have liked to make. If reform is the right word for a hand-break-turn-around-and-go-backwards policy platform. This impotency is surely of concern to you. The second reason I don’t think PM Abbott has been worth it for the Liberal Party is because he is deeply unpopular and very good at finding ways to increase his unpopularity. I don’t have time to give you the entire laundry lists of Abbott-stuff-ups that have contributed to his terrible polls, which you’ve no doubt noticed have been terrible since pretty much day one. Dodgy scholarships for his daughter, insane ‘captains picks’ such as the Knighting of Prince Philip, biting onions, shirt-fronting the Russian President, choosing only one woman in his cabinet and then making himself, a known misogynist, Minister for Women, a Speaker expense scandal and of course your own leadership spill shenanigans. Sometimes I wonder if Abbott is actually one giant satire comedy routine sent to entertain the lefty-lynch-mob on Twitter. I’m sure you’ve wondered the same thing. The bottom line is, Abbott as Prime Minister doesn’t make Australians proud to be Australian. The last poll I saw was Essential Poll which had the two party preferred figures at Liberal 47, Labor 53. And this is after Abbott’s spent most of the last few months doing his best to whip up fear about the ‘death cult’ with a growing collection of flags and tried unsuccessfully to mount a smear campaign against Bill Shorten. Is Abbott’s poll-boosting bag of tricks empty? This far out from an election and you’ve got nothing? This must be worrying for you. The third and final reason why Abbott most definitely has not been worth it for the Liberal Party is because his incompetence in managing the economy is destroying your long-relied-on strategic mantle of claiming Liberal governments as better economic managers than Labor governments. Of course we all know this mantle isn’t based in reality. But nevertheless you’ve used it successfully to win power, along with scaring people about national security, for the past 20 years. But how can you possibly think you can keep using this ‘economic competency’ line when Abbott, and his Treasurer Hockey, are making such a mess of business confidence, consumer confidence, growth, unemployment, debt and deficit and pretty much every other economic indicator that Liberal voters apparently obsess over when deciding that they will again vote Liberal. The bottom line is, your wrecking ball, which you used so successfully to wreck Labor’s electoral fortune, has swung back and wrecked your ‘economic competence’ campaign line. What will you do without it? I suspect you’ll lose. And you may not win again until Abbott has been long-forgotten by the electorate. How long do you think that will take? 50 years? Maybe even 100? Love your work, Victoria. Another insightful , incisive analysis. What a shame the pearl-necklaced, bespoke-suited, born-to-rule brigade are not big readers of the AIMN. The image of them choking on their crumpets as they read through this Open Letter would make my weekend. Never mind. It has brightened my morning anyway. I paticularly liked the”Rupert Murdoch and his flying monkeys in the conservative press”. Lol.